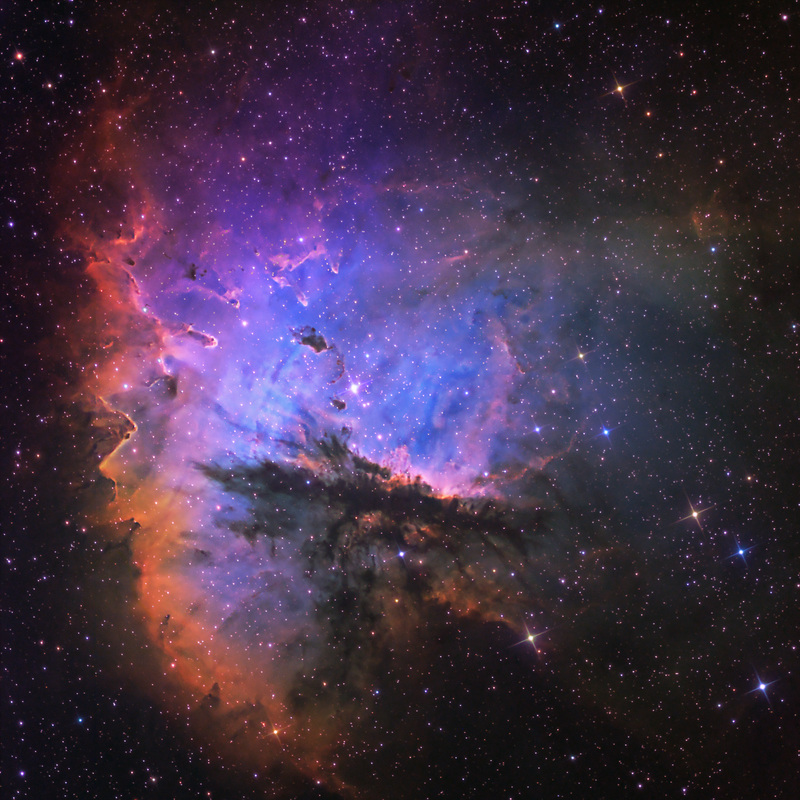 The PacMan Nebula, NGC 281, is a large emission nebula in Cassiopeia located at 0hr 52m 59s and DEC +56d 36m 19s at a distance of about 10,000 light years with an apparent diameter of 35′. The emissions are powered by the bright blue stars of the open cluster, IC 1590. The large dust region cuts through the emission giving the appearance of a partially cut circle, and hence, given the name PacMan. There are dust columns being sculpted by the intense radation from the bright stars in the cluster, all pointing to the center. Bok Globules, dark patches of dust and potential future homes of new stars, are scattered throughout. The detail in this image was achieved with Astrodon 3 nm narrowband filters. The colors are based upon the Hubble Palette, where OIII, H-a and SII were mapped to blue, green and red, respectively. RGB data were added to provide star colors based upon a G2V solar analog white point. Exposure: 17.5 hrs Total; 15.5 hrs OIII, H-a, SII, 2 hrs RGB. This is my first time to your page. Your work is extraordinary, extremely beautiful. I love this image PacMan Nebula in Narrowband. I would love to share the image. So I am asking for your permission to share. Also, there are so many beautiful photos here, it will take time, to absorb all the knowledge you shared, & thank you for sharing. Thanks, Renee, The PacMan image can be used with credit to me for any non-commercial use.